Good morning friends! It’s the final day of our 13th birthday celebration and what a day we have in store for you! If you have joined us from the beginning, thank you. We’ve loved all your comments! If you’re joining us for the first time today, we’re so glad you’re here and hope you’ll join in from the beginning HERE. Hi everyone! Paige Evans here with a new birthday-themed layout for the birthday celebrations happening here! So fun and exciting! This layout features a free cut file which you can grab below and my Whimsical collection with Pink Paislee. I started by die cutting my banner cut file from smooth white cardstock using a Silhouette Cameo 3. Then I used a rainbow striped paper to back all the little open spaces – I didn’t measure each piece, I just eyeballed the size and it probably took about an hour to back the entire design. Not too bad! I backed the larger spaces of the banner with a subtle pink paper. Next, I splashed watered down white acrylic paint across a purple ombre paper to jazz up my background, let it dry, and then tucked this sweet photo of my daughter under the right side of the banner. I used dimensional adhesive to attach the banner in place for depth and to create shadows. Then I came in with a new package of floral die cuts and tucked a bunch of them under the banner. I think that’s my 12th set of flower die cuts I’ve used lol – what can I say, they make the perfect finishing touch and help layouts come together so quickly! I created the title on the banner using colorful mini Thickers and placed a heart chipboard sticker between the words. To embellish I added a puffy sticker banner below the title and placed a dragonfly chipboard sticker overlapping the edge of the photo. Then I sprinkled enamel dots here and there for even more pops of color. I finished by writing my journaling in another section of the banner. Thanks so much for stopping by and checking out this new layout! See you again soon! Happy Birthday SCT Magazine! Today I am sharing a fun card that is perfect to give to that special someone for their birthday! Diecut a fun birthday themed design using a metal die or on your digital die cutting machine and make it the star of the show on the front of your card! Adding an extra-large image makes the card POP! I layered together different tones of the same colour of cardstock, adding foam adhesive to the backside of the top layer to add some easy dimension. Layer a doily behind your image to give your card that birthday feel – add a little flag to the top of the cupcake using a simple toothpick to add your celebration sentiment. Thank you for joining me today and HAPPY BIRTHDAY SCT! Thank you, Paige and Nicole, for two amazing birthday themed projects and a cut file today! We are now going to wrap up this celebration with our grand prize from American Crafts! LOOT BAG GIVEAWAY – GRAND PRIZE!!! 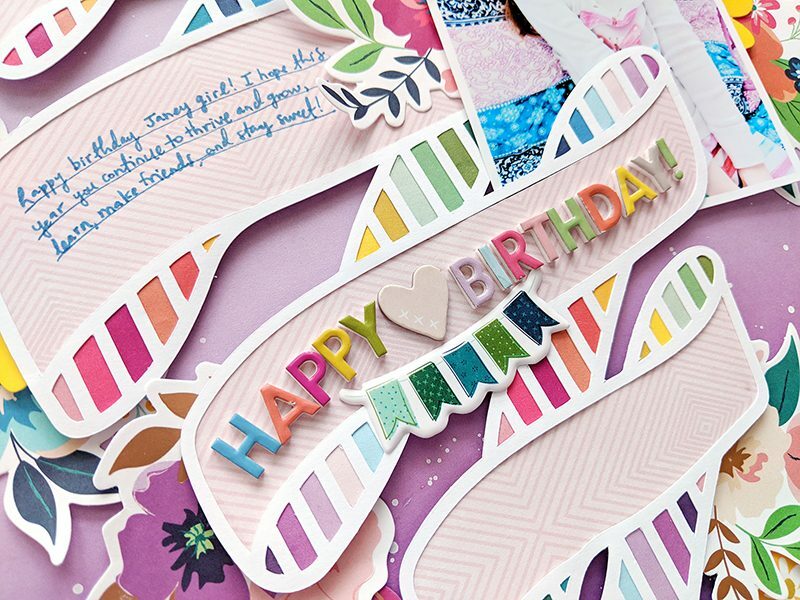 We just wanted to pop in and say HAPPY BIRTHDAY to Scrapbook & Cards Today! We appreciate our long-standing relationship with Scrapbook & Cards Today, and wish you all the best in the years to come! We’re excited to offer this special prize for this very special day…so who wants to win the ultimate scrapbooking prize? 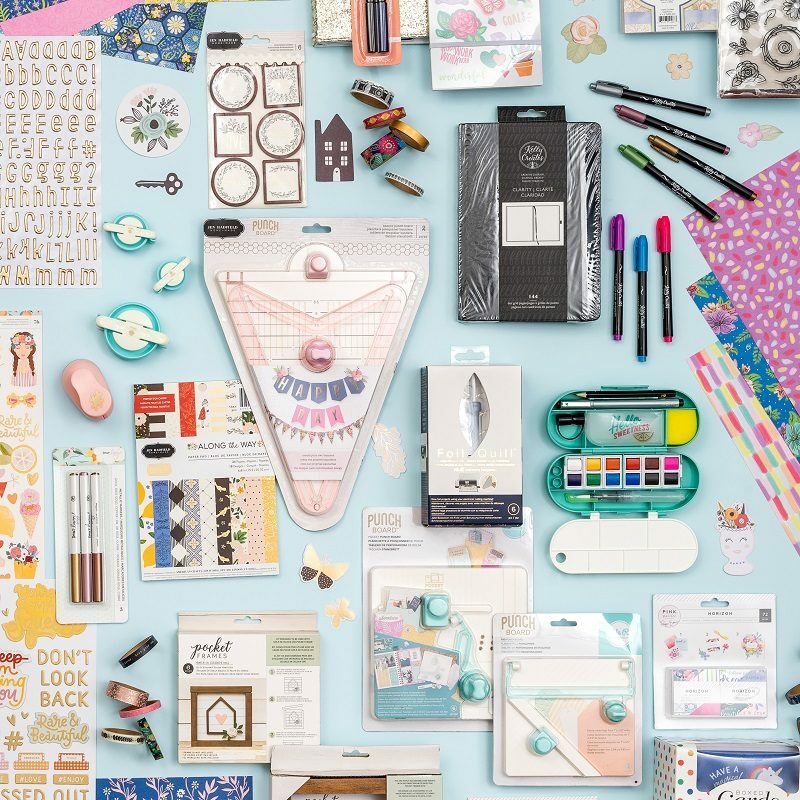 🙋 This grand prize is filled to the brim with products from American Crafts, Amy Tangerine, Kelly Creates, Crate Paper, and MORE! We’ve also included a We R Memory Keepers Foil Quill! Good luck! Thank you for all the kind comments you have left for each of our birthday sponsors this week! They have LOVED hearing from you! We hope you will continue that today by thanking our friends at American Crafts for not only this prize but for all the amazing support they provide to all that we do here at the magazine and with our Crop & Create events! One last thank you to each of our readers for joining us to celebrate our 13th birthday. We could not have imagined the joy we would receive from you for so many years. If you are newly joining us, welcome to the SCT family. Now let’s start planning our 14th birthday! The Pocket Play section is my favorite! This is the style I scrapbook in so I am always looking for design tips. Other than all the amazing layouts and projects, I love the design tips and tricks. I learn new things with every issue! Such a great page! Wow! and the giveaway is amazing! I loved the 3is. That was totally inspiring. WOW! This prize ROCKS! Don’t have any of these items and would love the chance to create with them! My favorite part of the Spring issue is the Ideas, Insights and Inspirations section. Great ideas to have at-hand for future layouts! Happy birthday SCT! This is a great magazine. I love the pocket play, the 3ts and creative cards. I enjoyed it. Oh My Goodness! Hold the Fort! What an awesome way to end a wonderful celebration! SCT thank you for all these awesome ideas and the fun that went along with it! Happy 13TH Birthday and cheers to many more years! Nicole’s birthday card looks good enough to eat! My favorite part of SCT Spring issue is “the essentials” on pages 11-13. I look for what is new to use in my paper crafting from tools to embellishments. SCT is a good directory of what’s coming, where to find it as well as how to use it. Thank you SCT for 13 years of inspiration and wishing you success in the years to come! I love the 10 most wanted article!!! Actually I love the entire magazine. That is a tough one as I love all the inspiration in this spring book. The pocket play section is a bonus and with doing the pocket Sct class it will be helpful. I love the top ten section where I learn about the latest products that are out. Love Paige’s layout! I always like the top ten section to keep up with the latest and greatest in the scrapping world. This prize is amazing, yes please! Happy birthday, it’s been fun celebrating with you! I love the pocket play section. Doing the SCT pocket class now, so fun! Happy birthday! Call me crazy, but I intentionally set my new SCT issue aside so that I can savor it slowly this weekend without any outside interruptions! Thanks for letting us all be a part of the birthday celebration! Paige’s layout is absolutely stunning! Her style is so incredible – I just love her creations! Wow, what an amazing end to this big, celebratory week! Thanks so much for the chance to win. My favourite part of the spring issue (every issue 🙂 is the “10 Most Wanted” – just love that section and then I know where to spend my money, lol. Scrapbookandcards you are amazing. Thanks you for all the beautiful price you offer to us for our birthday. Happy 13th birthdays. Love the die cut banner on the layout! !I love the essentials article and the design challenge – so many gorgeous layouts. This issue is filled with so much inspiration! Paige always creates the most beautiful layouts and this one is no exception! Happy birthday SCT! Thanks for a wonderful week of celebrations! Wow, such an amazing prize! Love Scrapbook and Cards, your magazine is so inspiring!! Happy, Happy Birthday! My fav part of the magazine is the Pocket Pages, as I love to scrapbook this way!! My favorite was the 10 Most Wanted article, always good to know what new products are available. This final give away is beyond words! Someone will certainly be extremely elated! Thank you for the great celebration! Fun prizes. My favorite part of the magazine is the section that says Creative Cards. I like how so many ways of using stencils on our cards is shown. I love everything about the spring issue, but pagemaps is my favorite! I have been trying to get away from kits with specific instructions and be a little more creative. These give me just the right amount of guidance. Happy Birthday and thanks for all of the great ideas! Love looking at all the beautiful creations in each issue, so much inspiration. Great prize to end the week. Love the layout with all the pretty colors! I loved the 3T’s article and the bonus page maps. I will be using both very soon. Thanks for the chance to win!! My favorite part of this Springs issue is the different layouts of the cover page! The photo of the adorable little girl and the different layouts are really great. What a hard choice to make for the cover! Thanks very much to American Crafts for this amazing giveaway! Happy Birthday SCT!!! Happy birthday, and what a great final giveaway! My favorite part of the new issue is the “10 most wanted” section. As a new scrapper it really helps me imagine new approaches to pages. When I started scrapping I had no idea how many different media could be brought to a page! The section, and the magazine as a whole, is truly inspiring. Wrapping up the BIG BIRTHDAY WEEK CELEBRATION…already? Well, its been another fun time reading all of the comments and trying to win the big hauls, and for that THANK YOU! My favorites in the magazine are the sketches and the 10 must haves. the Sketches have been a long time favorite of mine because of the inspiration and challenge. The top ten must haves, keeps me in the loop with all of the latest and greatest new stuff showing up in our paper crafting aisles & websites, love that too! I love the pocket play section. Don’t you love birthdays! Today is my birthday too. Happy Birthday to SCT and thank you to you and all of the sponsors today and all week. I am looking forward to making some of the cards, layouts and projects that you had all week. Happy Spring everyone. 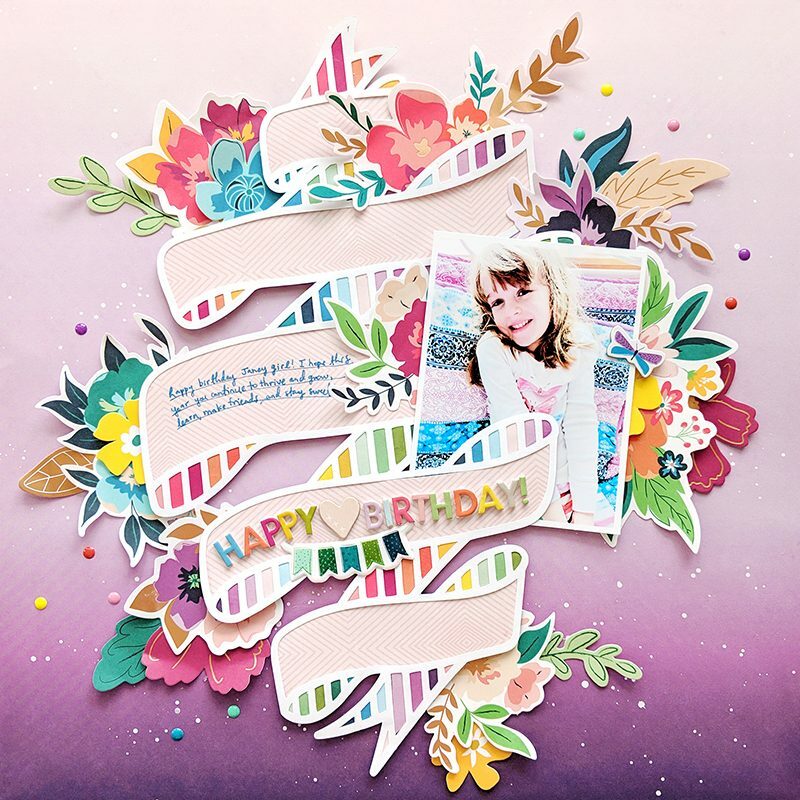 Beautiful layered birthday layout and card! Love, love, love, your magazine! It’s really hard to pick just one thing from this issue. I really like the layout on the front. I like the 3Is and all the new featured products too. What more can I say – you really have a great magazine! Keep it going! Happy Birthday SCT! Oh, and thanks to all the sponsors for all the great prizes. Great page with birthday wrap. SCT Spring Magazine, page 22 the stitched flowers, I realy want to try that. I am addicted to sketches…so the Page Maps sketches by Becky are def. my fav. What creative people work for scrapbook and cards! The scrapbook layout is so cheerful and spectacular! And that card!!! It is so ingenious! My favourite section of the magazine is the 3l, especially the creative card section. There’s so many examples of awesome cards! I wish you for the last time a very happy 13 th birthday. May you be around for at least another 13 years! You are awesome and spectacular, WOOT, WOOT!!! Ah yes i almost forgot to thank today’s sponsor for the amazing prizes included in the giveaway! So a great big thank you! Happy Birthday SCT! 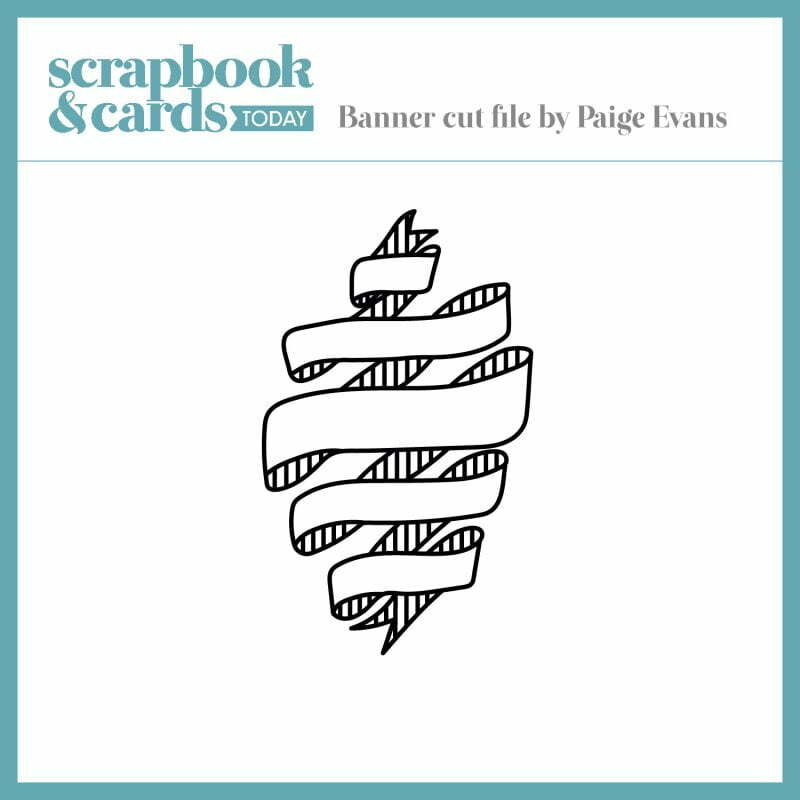 Thank you for the free cut file “Banner” and your layout Paige Evans, beautiful. Love Nicole, can’t wait to create with you this weekend at Crop & Create Winnipeg! I love everything in the spring issue, but mostly the pocket page ideas. Thank you for the chance to win prizes. Especially thanks to all the wonderful sponsors! Wow, absolutely love Paige’s layout! Almost makes me want to buy an electronic cutting machine … Really looking forward to taking one of Paige’s classes at Crop & Create Winnipeg this weekend, only 5 more hours to wait :). The Creative Cards section of the Spring issue has a whole lot of inspiration for me. Thanks for the chance to win an amazing goody bag. Have loved all the posts and fun inspiration this week. Great job everyone! I’m looking forward to all the posts coming from SCT and using wonderful products from companies that support our creative community. Thank you!!! Love that banner bday layout! So inspirational and beautiful design. Wat a grand giveaway prize! Again HB SCT and many more crafting years to come and TY to all the generous sponsors for their charitable support. My favorite part of SCT magazine are the free cut files and sketch page maps and all the inspiration layouts n ideas. 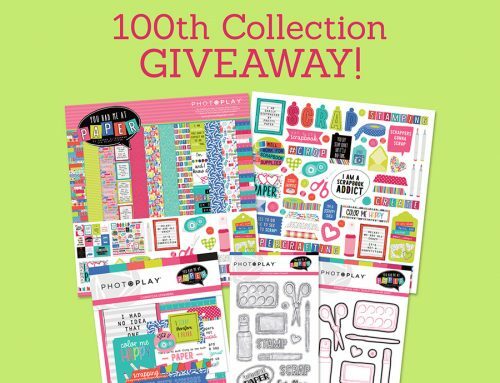 If I get picked to win I would like to share this grand giveaway to all my crafty besties! I love that layout and the cut file. I possess no technical know how so I have to try and figure out how to download the cut file but I definitely will! Thank you for a fun and inspirational week not to mention the opportunity to win outstanding prize packages. I’ve visited every one of your sponsors and so appreciate them as well. HAPPY BIRTHDAY and thanks for letting us celebrate with you. Love the 3Ts section, and the 10 Most Wanted under the Essentials section – very informative and inspiring! Thanks for the awesome giveaways and a wonderful week of celebration! Happy Birthday again, and many many more to come! Pocket play. Wanting to do a memory book about my daughter’s journey from Miss to Mrs and with all the wedding planning, this will be a quick fun way to do this. Thank you for the ideas and inspiration. Happy Birthday – – so far has been a fun celebration!! What a selection! I haven’t made any new purchases in awhile so these ideas and items would be a welcome addition. I seem to live each magazine more but have always loved Becky’s sketches and the pocket page looks really fun and interesting. Thanks! This giveaway is Amazing!!! My favorite was the design 101..these tips are always very useful for me. I love the creative cards and product play sections. So many great ideas! Such gorgeous inspiration! Love them all! Wishing SCT a wonderful birthday again! I am always so inspired and love reading SCT! Amazing week of celebrating and sharing! Thanks so much to you and your sponsors! I love the 10 most wanted section of the magazine. Thank you to American Crafts and We R Memory Keepers for the wonderful prizes to win! Happy Birthday to SCT Magazine. It has been a pleasure to get to know you this you! Thank you for printing your beautiful magazines! We can only pick one thing? I’d say ALL the great ideas for pages and cards. But if I can only have one I’d say the crawling page. So many baby pages are for girls and this one would be great for about (specifically my new grandson coming in July). Thanks for the cut file. I can hardly wait to start playing with it! The Spring issue has so much inspiration after this long, dreary and wet winter! I enjoy the entire magazine but like seeing the top Tens. Amazing grand prize–thanks to all the companies involved. I’m a card maker so my favorites are all the card making articles, I also love Cathy Z and her words of wisdom. I love to look at new products, so the “essentials” and “product play” always get long looks. I tend to savor your magazine–first an initial “gazing” followed by specific reading of articles . I much prefer holding the magazine to looking at it online. I do most of this as I watch TV news with hubby, makes me calmer to look at your beautiful magazine. .
What a wonderfully inspiring – and generous – birthday celebration! Thank you for the multitude of smiles and ideas shared! 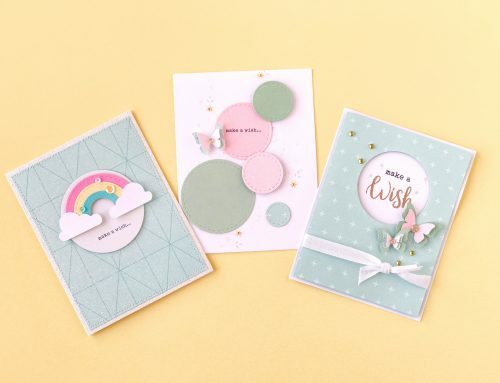 My favourite part of the SCT magazine is the Creative Cards section; always something creative to tantalize our creativity! Happy Birthday day 5!! The whole magazine is amazing! I really enjoyed the Creative Cards section in the 3Is. OH my word….what a spectacular giveaway! Above and beyond in generousity!!!! I just received the beautiful Spring issue of Scrapbook and Cards today, and must say..I am pretty impressed with Echo Parks 3 page advertisement.! I thought it was part of your issue as far as a card class at first!! My word, absolutely beautiful advertising! Anyways, that’s not what you probably wanted to hear. … so I would have say, I always, always enjoy seeing the essentials and how fun for those of us who recieve the SCT sampler, to see the My Mind’s Eye collection, picked as one of the essentials, and we were already able to play with it!! I also enjoy seeing the designer challenge and how each artist uses the Same product, but in such different ways and all so beautiful! !..love seeing the Butterfly Thinlit dies by Stampin Up being showcased this issue! The Creative Cards article was a win, win for me, as I teach card classes, and loved seeing some new ideas that I have never seen, nor taught before…so a big thank you for that! Congrats yet again on your 13th Anniversary/Birthday! My favorite part of the issue is seeing how people are using the downloadable cut files and then trying to do some of this myself. This birthday page is a stunning example! Paige Evans is very inspirational! Too 10 is my favorite section! That, and the reader gallery for inspiration! Its been a great week of celebration for SCT and us! I actually just finished reading the spring edition last night and honestly when it was done…I so wanted more. I wasn’t ready to say – see you in the summer. One of the sections I go to first when it arrives is the inspiration gallery – always looking for work from someone I know! Then I go to the new products, and then start at the beginning and savour each and every page. Often I have post it notes with me to mark the ideas I really want to try. This final prize is totally awesome. Would be a great package to share with the ATCG when we have our weekend together on National Scrapbooking day. Thank you Catherine and your entire team for everything you do for us. What a wonderful week – Happy Birthday again and thanks for all the great prize opportunities! I love the 3is section and the celebrate new things theme! Wowzers! I’m loving today’s projects, especially that free cut file from Paige!! Thank you Paige!! And what a fabulous grand prize!! So awesome! My fave parts of the magazine are the Page Maps, Product Play and the 3i’s columns. Pocket play fun, fun, fun! Pocket Play is my current favorite, as I’m taking Meghann’s In the Pocket class this year! But I always love Product Play and Creative Cards! It’s been a fun birthday celebration – keep it up, SCT! I really liked design 101! Happy birthday! Really love the layout on page 26. I have so much felt and this is a great way to use it up. What a great Birthday celebration week- lots of ideas shared, thank you! I enjoyed the 10 Most Wanted article in the new Srping edition. My fav part of the SCT mag is the inspiration, sometimes you need a jump off point. Also, you get to see what is new out in the scrappy world. I liked the 3ts section! I live florals! Happy Birthday!!! Thanks so much for the chance to win such a great prize! I love your magazine. I always flip to the 10 Most Wanted first, but I love the 3i’s, Pagemaps & of course, The Reader’s Gallery. Have fun being a teenager & we look forward to many more years! Happy Birthday once again. I love the Spring issue of the magazine. It keeps me up to date on new scrapping products. It is full of inspiration too. Thank you. I love the pocket play section! Wow, so many beautiful ideas and tips in the Spring issue. My favourite is the idea with stencils for the cards. Thank you once again for inviting us to celebrate with you! Till the next Birthday- have a creative and fruitfull year!!! Wow!!!! What an amazing prize! I always love the Designers Challenge article. It makes me want to get into my stash and try different things with what I already have. I always love the Top 10 essentials. I like to see what is new and a must have for my wish list! Happy 13th Birthday SCT! A big thanks to all you generous sponsors! The 3i’s would be my favorite part of the Spring issue – such beautiful ideas! I love the front cover and those flower embellishments. Amazing! My favorite part was the cover, such a beautiful layout and perfect for spring! That is a lovely layout. I don’t scrapbook but that has really got me interested. When I looked through the spring issue there were a couple of sections that I really liked – the mini album (I have to come up with a few in the near future), the creative cards and the “How it works” article. Wonderful edition. The front cover is beautiful. My favorite are page 50 the inspiration challenge and page 62 make it mini. Thanks for the chance. My favourite part of the magazine are the sketches with their fabulous examples. I love to start my projects with a sketch. Holy cannoli! These are some great prizes. It’s been so much fun celebrating your 13th birthday! Gorgeous and sweet projects! What an amazing and generous prize package from American Crafts! I love the 10 Most Wanted article, fun to see what is trending. Thank you so much for the inspiration, the gorgeous cut file, and the chance to win these fabulous prizes! I can’t wait to get my issue. It should be here any day. Pagemaps are my favorite, and a great starting point for my layouts. Thank you so much! The birthday card looks sooo yummy! Thank you for all the fun! Thank you 13 years of inspiration and BEAUTY! Thank you for the wonderful prizes this week too! Wow, what an awesome prize! I have not seen the new issue yet because I am waiting (im)patiently for mine to come in the mail! Happy birthday and thanks for the chance to win! What an awesome prize pack! Thank you to American Crafts for their generosity. My favourite section of the most recent issue of SCT is the Ideas, Insights & Inspiration pages. I’m always looking for new ideas and a little extra help! I love seeing two-page layouts with multiple photos. That’s how I (and everyone I know) scrapbooks in real life. Thanks for the opportunity to win. Always Cathy Zielske’s column. I love her clean SBing LOs…and her cards are the cutest. Happy 13th! Oh my!!! Awesome grand prize!!! Thank you so much for this chance to win!!! My favourite part of the new spring issue is the 3Ts, Tips, Tricks & Techniques! I love how colorful the entire issue is. Which certainly shouts ‘Spring’! Lots of great projects, too. Happy Birthday, SCT!! I especially love the layout with the felt flowers and all the eye candy from the pretty advertisements! Wow. Such awesome sponsors for the prizes. My favorites are the page maps and the three Is. So many cute things! I liked the stuff on page 5 the best. My favorite part of just about any issue of SCT is the challenge article. Seeing how three different designers treat the same theme with the same materials is always helpful and inspiring. The creative card section. They are all really colorful cards. Happy Birthday and thanks for all the chances to win! Loving this Spring Issue esp the 3T’s section – very inspiring!!! Thanks for the chance to win this awesome package!! Oh my!! what a beautiful layout. The cut file is great too. Thanks so much. Love the card. I need to get me a Silhouette Cameo 3 so I can do the cut files here at home instead of going to a friend’s place. I”m seeing too many of these cut files I could use over and over. I can’t believe the week is over. Thanks for all the wonderful ideas and the prizes. It’s been a great week. I love the essentials section! So much new fun stuff!!! I always love the 3i’s. I learn so much from the designer tips. It’s a great issue, but since I struggle making pocket pages look good, I really loved this article! Such great ideas! 10 most wanted article was great! And what a fantastic way to end the week! I love The Top 10 section. Thank you for the chance to win such a great prize!!!! The 3is section was very inspiring! What a way to celebrate a birthday! Amazing prize today!!! Would be lucky to win this. This is an amazing giveaway!! I love everything in it. Thank you for the opportunity to win this wonderful package. I love your whole magazine but I especially like the page maps!! Thanks for the chance to win this awesome prize package!! Happy 13th birthday once again! Love your magazine……and the chances to win fabulous prizes! Thank you for the chance to win this amazing prize package! SCT my favourite are the layouts! Thanks for all your effort! My favorite part of the Spring magazine is the pagemaps section. I love using sketches and I love seeing how other people use them too! Happy 13th Birthday SCT and thank you for a fun filled and inspirational week! The prize today is beyond awesome! Thank so much for a chance to win! Happy 13th Birthday. Another amazing blog full of inspiring projects and a great gift package. This has been a fun week. And I love the Spring issue, it is jam packed with techniques, so many that are new to this beginner scrapbooked. My favorite is the designer challenge. It was good to see how the same 4 products are used in different ways and styles. This will help me stretch my supplies. Love the 10 Most Wanted article! Thanks for the banner cut file. Beautiful layout and card. What a great celebration for your 13th Birthday! I like the Creative Cards section, so many fun projects to inspire me! My favorite part is seeing all of the inspiring scrapbook layouts and cards! I also love the designer’s challenge where they use the same products to make very different layouts! Happy birthday SCT! How exciting!! My favorite part of this issue is the creative cards section as I am a card maker. Gives me new ideas to try. I like 3Is most and the part about story designing. The whole magazine is always awesome! The spring issue is especially outstanding in “the 3Is: ideas, insights & inspiration” section. 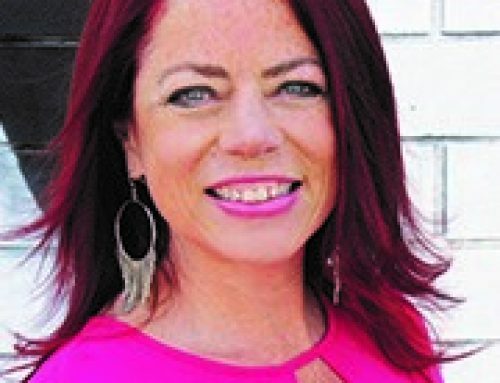 I especially liked Cathy Zielske’s “design your story” column and Enza Gudor’s “make it mini” article. Well, for this issues it’s got to be the cover that’s my favorite part. I’m a country girl at heart and baby chicks just get to my heart. Happy bday sct! I’m new to this and the best thing for me was the essentials section. Love design your story. Love Cathy’s Pages! Thanks for the chance to win! 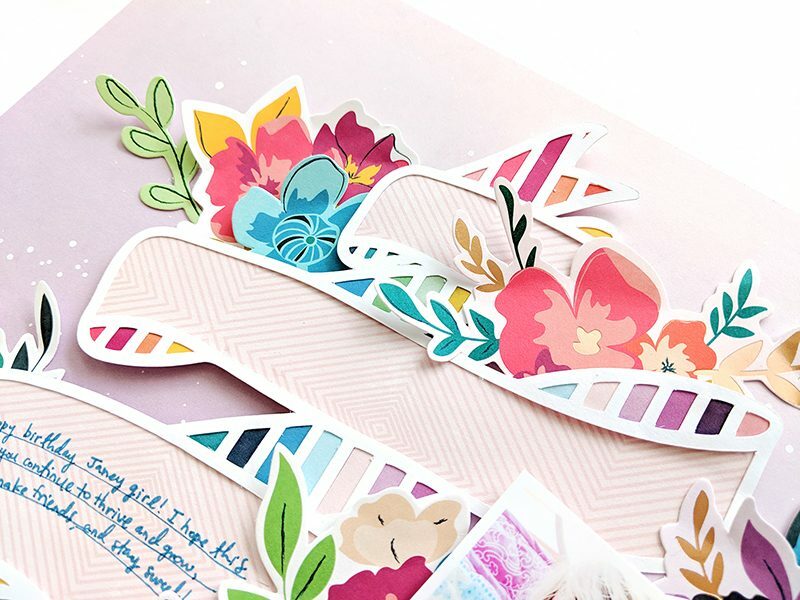 Love the cut file as well as Paige’s layout using it! So much to love about your magazine and blog! Such a beautiful layout! My favorite part of the Spring issue is the “10 must haves”. Thank you for this fun and inspiring Blog Hop. I love to see new projects and how they are accomplished. My favorite part of the Spring issue is the Creative Card section. 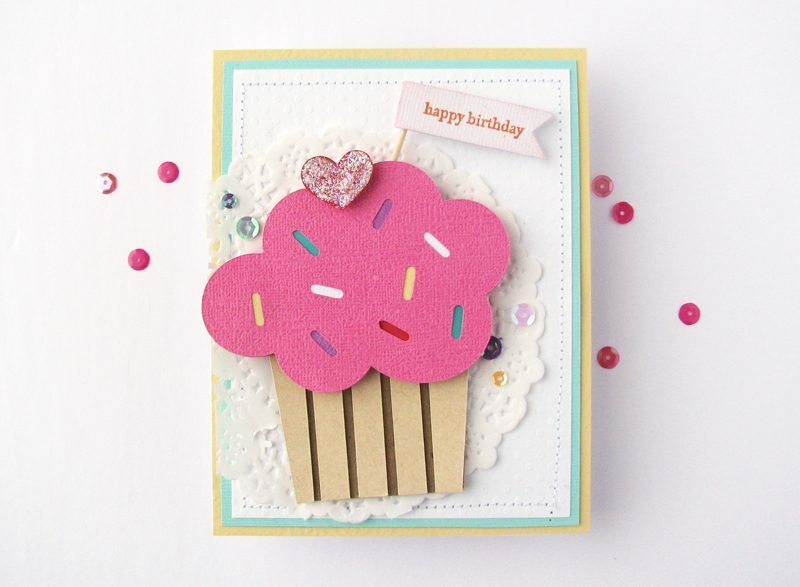 Love that cute cupcake card! Happy 13th Birthday, SCT! My favorite part of the magazine…. the Creative Cards section! I love all the inspiration and actually I like to look at the ads to see whats new. Happy Birthday. Loved seeing the 10 most wanted! Love Paige’s LO today! I loved the Fabulous Florals, Design 101, and Creative Cards sections. This has been a fun week – Happy Birthday! I loved all the samples and of course the scavenger hunt for sweets. I love the ENTIRE magazine, but if I had to choose….I love the Page Maps section. I love seeing how people interpret the page maps! My favourite part of the new spring issue is the Creative Cards section. Thanks for the chance to win and Happy Birthday SCT!!! The grand prize is AWESOME!!!!! Happy 13th birthday ! I love the whole magazine, and dream of one day being featured in your reader gsllery. I love that section for its variety of talent. Happy 13th birthday , and thank you for this opportunity. I love the ten top section. Happy birthday for your 13th celebration, enjoy! Love the magazine but liked the top 10 wanted! Tks! The sketches that keep me inspired to create more layouts! I liked the article about using elements in threes. Wow, it’s like striking gold!!! Birthday celebration!! So pretty!! What a birthday celebration! Such amazing companies and amazing inspiration! Thanks SCT for all that you do for the Scrapbook world! Happy Birthday!! Loved all the ideas in cards and layouts in the Spring magazine! Happy 13th Birthday! Thanks for all the great prizes to win. My favorite section of your mag is the inspiration gallery. I love to see creative minds at work! (One of the reasons I love your blog too.) Thanks so much for allowing us to share in your celebration. Happy 13th, SCT! Love the magazine and the Why it works issue is very useful ! Especially the second layout which is so beautifuuul. I like both the 10 Most Wanted and the Creative Cards articles. I am a product junkie & love seeing your fabulous new product picks. I am really getting into card making lately & love all the fabulous card ideas!. Thanks for all the great content in your magazine. I really enjoy reading it! Happy 13th Birthday SCT!! Wonderful spring issue! My favorite parts are the designer challenge and the sketches. Thanks for the inspiration! Happy Birthday, SCT! I am favoring the Pocket Play articles these days ever since I started Meghann Andrew’s SCT pocket page class. I am learning so much and am on my way to documenting the little things that make up my 2019. Thank you for the week full of inspiration, fun and prizes! I am getting back into scrapbooking after a hiatus just in time to document my daughter’s high school graduation! I love this issues 3is to help inspire new ways commemorating this big moment in both our lives! The items in the giveaway will help me get started!! What a great week! 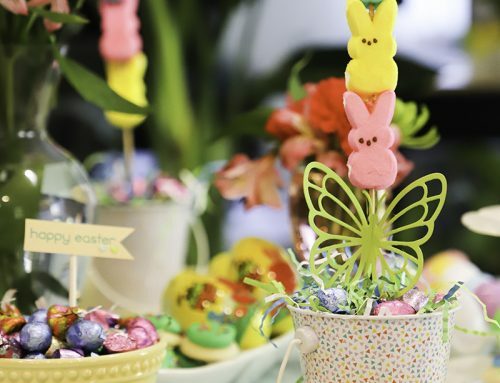 My favorite part of the newest issue of SCT was the creative card’s and the adorable bunny /Easter card. Hapy bithday!! I’m new here. I like your colorful style and especially the tips & tricks flowered section. Let be all these products!!! Awesome giveaway! Loved the 3is pages! Such great projects! And I always love the Pocket Play section-pocket pages are so fun to put together. My favorite is definitely the page maps. I love the top 10. Actually I love the whole magazine. What an awesome grand prize giveaway. Thanks for a chance to own these great products. My favorite part of this issue is the 3 T’s. I like the make it mini section. Happy 13th Birthday! The entire magazine is wonderful and it’s totally inspiring me all the time to do more creative scrapbooking. The magazine is my favourite… Thanks again for the 13 years of wonderful inspiration. Amazing giveaway! I like the creative cards. Stunning layout and thanks for the freebie cut file! My favorite part of the spring issue is the 10 most wanted items. I love hearing of new products to try! Thanks once again to the awesome sponsors for a fabulous loot bag full of drool worthy goodies! I loved so much about this issue. I loved the Pocket Page because I am trying to get some more photos put into albums and love how this is a great way to scrap events where you have a ton of photos of the same event. I also love the 10 most wanted because I love shopping for supplies almost as much as playing with them and so love seeing the new goodies. What a great lay out with that cut file Paige. Anyone would love to get that birthday card Nicole. How cute to have a heart 💓 for a cherry. My favorite part of the spring issue is the 3i’s. I haven’t scrapped in a long time and I just came into some old family photos. That will help me get a good start. Thank you #sctmagazine for letting us all celebrate your 13th birthday with you. Happy Birthday! And thank you to American Crafts for.provding the amazing grand prize. What an incredible giveaway!!! I loved all of the beautiful layouts this month! So many talented designers sharing their gifts. Was such a beautiful publication inside and out! What a fantastic prize! I always love the Inspiration Gallery and as usual I found plenty of inspiration in this wonderful issue! Loved your 13th Birthday celebrations blogs. I love the top 10new products. Love seeing new things even if not something I can use or need myself. Wonderful prizes every day and special thanks to grand prize sponsor, American Crafts …you always provide amazing products. Congrats on your 13th year!! Always impressed by this magazine and all the work of the contributors. My favourite part of the Spring 2019 issue is the designer challenge. Would love for you to consider coming further west with the crop & create. Looking forward to year 14 and more. Awesome giveaway!! It would be hard to pick just one fave thing and I’d provaby pick my first published layout as my first on the list😊 and the second is the tips tricks and techniques section. I always love this section!! In this issue I am in awe of Natalie’s layout on pg 22!! Gotta love the new cut file. What a great scrapbook page, Paige! I also enjoy seeing what Nicole is doing , I love seeing her new designs of cutting files each month. As far as the magazine goes, I love seeing what new out there. I miss having a large scrapbooking store to browse through although the little specialty shops are beautiful, they don’t carry everything! So, I love to see what’s out there and what I might buy. Happy Birthday!! Fantastic giveaway too!! I really liked the tips and tricks section of the magazine. It’s always an inspirational magazine but it also makes me jealous of all the talented crafters out there and all the supplies/tools available (that I don’t have). Happy crafting everyone and Goodluck! Happy Birthday! The 10 Most Wanted was my favorite part of the magazine…what a fabulous prize! Wow! What a prize!!! My favourite part of the magazine is always the top ten – new products for me to see and love. Fantastic week! I like the inspiration gallery! It helps get my creative juices flowing, and give me ideas for layout/design and embellishment ideas. I can always use inspiration and the new inspiration challenge in your magazine is awesome! I cant even imagine winning such a huge prize! It just seems like yesterday when I got my 1st Scrapbook & Cards magazine. Congrats on 13 years of sharing. Love the 10 Most Wanted article and the craft room organization article! I like the Take 2 & 3. I really don’t know how you decide which you are going to use on the cover. But it’s proof that there is no right way. Happy Birthday and thanks for all the inspiration! Love all the rainbow colors on the layout… So pretty. My favorite is the 10 most wanted. I love all the inspiration and ideas from your magazine. I like the inspiration gallery the most. Thank you for a chance to win another great day of another awesome prize package. I think my favourite part of spring issue is the Make It Mini as well as all the wonderful inspiration throughout entire issue and tindinfnthe sweet treats was a fun way to flip through the issue!! Happy 13 years and cheers to many more!!! My favourite from the spring issue is the scavenger hunt for the birthday celebration! What a PARTY! 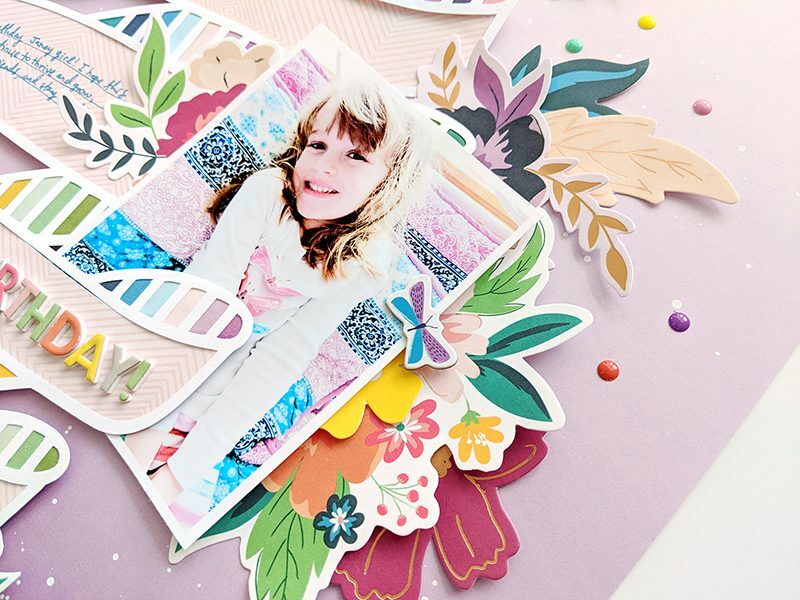 Just LOVE the free cut files from Paige, and all the inspiration from your talented team! My favourite is the 10 Most Wanted! Can’t wait to see what’s new and exciting! Wow! This issue is jam packed with favorites! I love the 3T’s as well as the 3I’s. The grand prize is amazing!! The Top 10 section is my fave! This birthday celebration has been awesome! Love the projects today … especially the layout by Paige! Her cut files are great! I love the Top Ten section! Actually love everything about the magazine! Happy 13 th again! Thanks for the chance to win! What a grand scrapbooking prize indeed. I love to scrapbook and would love to win this amazing prize. My favorite part is seeing all of the projects and pinning them so I can use their inspiration later when I am creating cards or scrapbooking. Bannerific layout! LOVE the design and floral accents! 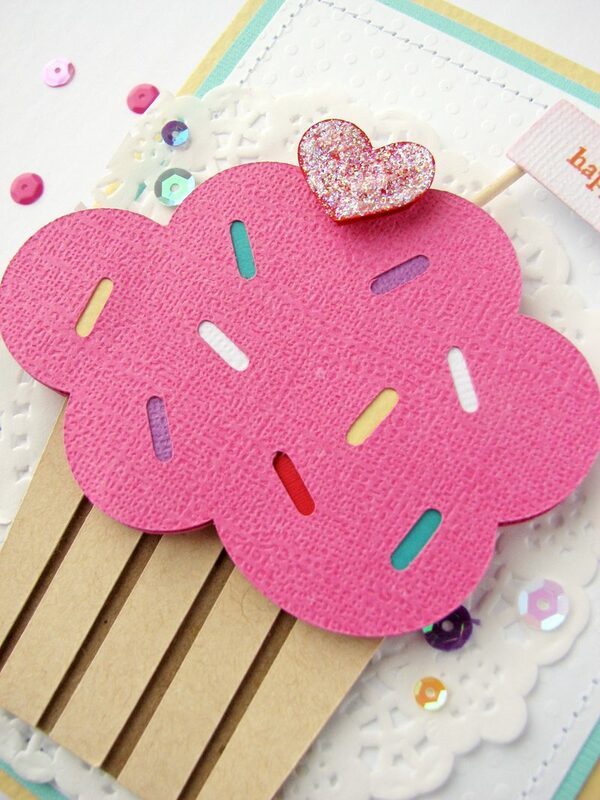 LOVE the sweet and tasty cupcake card too! The BEST part of the Spring issue was … searching for SWEET TREATS and being INSPIRED along the way 🙂 Seriously though, this issue is FILLED with CRAFTY AWESOMENESS, especially the 3Ts, because I’m addicted to flowers, love using sketches, need storage options and fascinated to learn how design features work => THANK YOU! I haven’t looked at a papercrafting magazine in quite some time. I really enjoyed skimming it & intend to read it cover to cover later. It may sound silly, but I liked the ads a lot! Once again a beautiful lay-out, I love it! And the prize today is amazing. My favorite section in the Spring magazine is the Ideas, Insights and Inspiration section. Lots of new ideas to try on my own projects. Once again, Happy Birthday, and many more happy years to follow! Fabulous layout. My favorite is the 10 Most Wanted and the Page Maps, but I love it all. Thanks for all you do and wish the best for another 13yrs! Thank you for the inspiration! Happy birthday S&CT!!! My favorite part of the Spring issue is the 3ts…tips, tricks and techniques! I love the floral theme! I really enjoy trying out new techniques on my layouts, like on page 22 the hand-stitched florals are so gorgeous! I love the tip of letting them go off the edge of the page. The fringe felt flowers on page 26 add so much texture, which I absolutely love on my layouts…lots of texture! What a grand prize giveaway! Here’s to another year and many more to come! Wow. Beautiful layout Paige! What a wonderful prize package SCT. Thanks for all you do for us! As for this magazine issue, I always love Cathy Z’s articles on design. I loved Nicole Nowosad’s felt flower layout! I did not look at my SCT magazine yet as I am saving it to devour next month on the beach but I do admit I looked at the 10 most wanted lol. Always love love love this section. Happy VERY HAPPY 13TH BIRTHDAY SCT and thank you so much for all the fun and the liovevyou guys share with us, it shows that you pour your heart out for our happiness and enjoyment. I followed all week and it was the highlight of my day, and thank you to all the WONDERFUL SPONSORS. Off to Instagram to thank all of them and you SCT. Super fun projects to end an amazing week. LOVE the file cut banner. Huge TY to AC for offering up such a massive goody bag and to the SCT team for hosting this amazing week. Here’s to another 13 (or more!) crafty years. I love that the magazine opens with top ten -then as I go through I’m thinking about those top ten products and how I can use them!! Congrats again SCT on 13 years!!! The sweet treat scavenger hunt, and flipping through at least 3 times to find all the ‘easter eggs’. Found lots of inspiration every time I flipped the pages! Thanks for the chance to win during your birthday celebration! I always enjoy the 3T’s articles, new product spotlight, and the Design 101 article was good too. I love learning new techniques from the designer challenges section of the magazine. The layout and card are so fun, love the layering and bright colors. Thanks for another fantastic giveaway and Happy Birthday! Product play and 10 Most Wanted are my favorite sections of the Spring issue because I get to see some wonderful new products. Of course, I love to see all the cards and layouts for inspiration. 10 Most Wanted, and they are. Happy Birthday and great giveaways, enjoyed all the beautiful inspiration! I always love the inspiring layouts, they jump start my creativity. It’s been a fun birthday week! It is a toss-up between page maps and design your story…love them both. Your birthday celebration has been our celebration with all the amazing sponsor prizes. I really liked the feature on stencils, starting at page 51. I always enjoy the fresh new ideas, trends & products featured in your magazine. My favorite part is Creative Cards, because it gets me excited about making my own new card designs. Happy Birthday! My favorite part of the spring issue is the ideas insights and inspiration section! So many great ideas!!! Such an amazing prize offered today that will bring absolute joy to the fortunate winner. I really enjoyed the Design 101. Thanks for making us part of this fabulous celebration. Happy 13th birthday and may you continue to grow and prosper. I love the top ten and pocket play!! Happy Happy Birthday SCT!!! I loved the tips, tricks and techniques. Especially the hand stitched flowers. I love everything about your magazine that it’s probably time to invest in having a paper copy come to my mailbox! I read it cover to cover, letters, ads, tips and tricks, cards, page maps, new products, designers, etc. And if I hadn’t read this month’s ads I wouldn’t have known that scrapbook.com is carrying my fav paper storage! Yay! I always enjoy the sketches, they come in handy every time I sit down to scrapbook. But this issue I really enjoyed the article on pocket pages. Have not yet had a chance to see the new spring issue, but I always look forward to it ALL!!! New products, tips and techniques, spring themes: what’s not to love. Happy birthday! Hope to see you around for at least another 13 years! I love the designer challenge, I always like seeing what different people come up with using the same supplies. Happy birthday! The layouts are very helpful and the tips and tricks are wonderful. Love the stencils feature. I love the banner die cut. So cute and fun. Looking forward to getting my copy of the magazine soon. seeing all of the great products being advertised. I love the 3T’s and Pagemaps. I make cards so these articles had some great card tips. Thanks for the chance to win! I have to say the card stencil ideas! I loved everything tho! It’s so hard to choose just one favorite thing lol! But I struggle with stencil use and this was amazing. This is an amazing prize! I don’t have any of what’s pictured! I’d love to win! Thanks for the chance! Happy Birthday!! Love the two page layouts and finding the sweet treats! So many great articles but I would choose the 10 Most Wanted Essentials. I love reading the Pocket Play section as I recently bought some pocket pages and am learning how to add them to my albums. Thanks for a wonderful celebration, and chance to win prizes! I always enjoy all of the layout ideas, when I set down to do a layout my mind just goes blank or I tend to do the same thing over and over. Having fresh new ideas is always a BIG help! I really liked the sketches this month. Alot if diversity in them!!! My favourite part of the Spring issue is the Inspiration Gallery, but I also enjoyed reading and learning from Design 101:Why it works. Thank you for such a great magazine. I think it’s both the scrapbooking pages and We R Memory Keepers products – the flower storage container is beautiful. Love the scrapbooking inspiration. I’ve not yet begun scrapbooking. The Inspiration Gallery is always so fun, love seeing all the projects! Oh my gosh!! Love that banner!! I really “need” and electronic die cutter. Tip, Tricks and Techniques!! I always love to learn new ways of scrapbooking. These pages always inspire me!! Happy 13th birthday. You remind me that all dreams, no matter how small are POSSIBLE!! I haven’t scrapped in several years now and after looking at all the inspiration i feel motivated and excited to get some pages made. Thank you and Happy Birthday! I loved them entire issue but my favorites would have to be the gallery showing others work and I loved the Belle Fleur paper by Becky. I love looking at the sketches and layouts to get great inspiration. This is a great giveaway. What an amazing birthday gift! Love the magazine and kits. SCT, you know how to end a party with a BANG! Beautiful creations by Paige and Nicole, and a loot bag that would delight anyone. Again thank you for all you do for us and for the incredible relationships you develop with your sponsors, that make these parties possible!! I love this magazine and everything in it. I always enjoy looking at the page map ideas. And it is all free! Thank you for that. Such fabulous prizes throughout this entire celebration! You’ve got some very generous, special friends! I’ve had my issue of SCT sitting on my desk for a few days now. I’ve been saving it for this weekend. I’m taking two of my sisters to Atlantic City for their 60th birthdays, and I’m bringing my magazine to share. I know my favorite will be PageMaps, because that’s always my favorite section! It’s a close second to all the beautiful layouts throughout each issue. I love seeing all the different card ideas. Like make your own background. Because I just adore flowers I love the Fabulous Florals section. The layouts are just too pretty. But I also like the Celebrating New Things Section. Such great ideas and inspiration. The top layout above is just gorgeous! I am lucky enough to have a cutter so I quickly downloaded that! Thanks for letting us celebrate your birthday with you! I love the 3 Ts which I find to be very useful. I’m so excited! I love all of the valuable information in each one! I would LOVE to win this! Everything! All the colors used! Great inspiration! Pagemaps has always been my favorite section. So much so, that I keep a 6×8″ index box of all the pagemaps so that I can reference them when I go to create. I also love all of the bold & colorful ads, because I learn about new products. The layout is beautiful and I will be getting that cut file. The cards are great, love how the cupcake was made, so adorable. Wishing you many more wonderful birthdays. And this prize will be like Christmas for someone. The sponsors and SCT have been so wonderful throughout this birthday party. Thank you. Thanks for the awesome banner cut file. I can’t wait to use it. It’s like getting a loot bag after a birthday party! Happy Birthday Scrapbook and Cards Today! So proud of another Canadian magazine that has survived the demise of the Scrapbooking magazine industry. Happy Birthday ~ 13th is the BEST! The Top 10 is my favorite and I just have to say THANK YOU for the digi download for the layout! It is fabulous! HAPPY BIRTHDAY one last time!!!! I love the pagemaps section! It challenges me to do something different! Gorgeous LO! Amazing prize! My favorite part of the magazine is the inspiration gallery! This has been a fantastic birthday week for you to share with us! The amazing projects and designs were just so amazing! What a way to celebrate! This swag bag you have put together for the last day is awesome! Because it is still chilly and there is snow waiting to melt here in Alaska, I am loving seeing all the bright cheery colors in the papers and layouts. So much fun! It’s so hard to pick the one thing in your magazine. I love browsing through each page, often re-visiting it in detail. I often bookmark the page sketches and love the free cut files! Happy 13th birthday!! What a wonderful way to celebrate with Pink Paislee and American Crafts. Such lovely inspiration and a wonderful giveaway. Thank you American Crafts. Happy Birthday!! I love the magazine ; my favorites is the 10 must have. Happy birthday SCT. I love the 3Ts. I find all sorts of new techniques to try with that column. Thanks for the chance. What’s my favorite thing in the Spring 2019 SCT issue? That’s a hard one because it’s packed full great things, but my very favorite would be the”3is” ideas, insights and inspiration. Amazing article and inspiration for me. Happy 13th birthday SCT! I enjoyed all the fabulous inspiration from all the designers. Truly amazing talent. And thank you to all the fabulous sponsors! Such generous giveaways. Hi once again and thank you for an amazing week of sharing in your birthday celebrations! 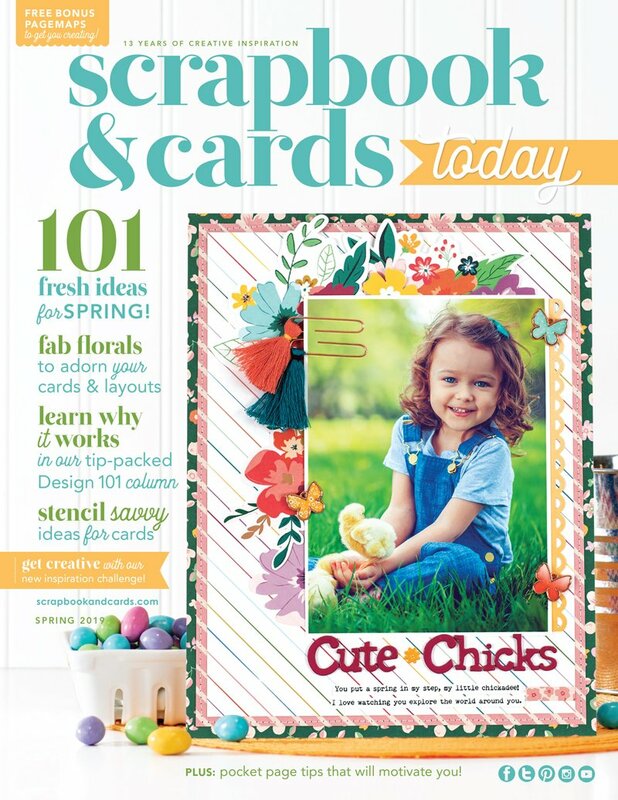 I love the part in the magazine where you share what is new on the market to use in our card making and scrapbooking. I am always excited to get something new to try out…what I need is a professional organizer to come and help me organize my craft room! LOL. Thanks once again and I look forward to many more years of inspirations from your amazing magazine! Love what you did with the banner! Fabulous Florals was my favorite part of this issue. Happy Birthday SCT! The article on design tips!! I’m always interested in learning more about design principles! My favorite part of the spring issue is Fabulous Florals. I love to use flowers and floral prints on my layouts, and this article gave me ideas for new ways to use florals. Thanks for the inspiration! And thanks for the giveaway with awesome prizes, I gotta love the pocket play in this new SCT issue. This is mind blowing so many things. Who could ask for more. Thanks SCT and to all of the wonderful sponsors. Happy Birthday and many more. Keep up the good work with all of your creative ideals. Wow! What a way to end a great birthday celebration. All of the designers have done such a wonderful job and thanks to all the sponsors for their generosity. I love all the SCT magazine but enjoy the TOp 10 most. Thanks SCT for all the inspiration. Here’s to many more birthdays. I love the Top 10! I love it all actually! I am always drawn to the design 101 section, this months layouts were fabulous. I also like the ads (I would never say that about other mags!)! Wow, this is a great prize package. My most favorite part of every issue is your “10 Most Wanted” section, and I also love your tips, tricks & techniques section. But it is hard to pick since I really just love your whole magazine. Again, Happy 13th Birthday, wishing you many more. This is awesome! I love the pocket play section and the top 10. Happiest of birthdays! I love the Home Sweet Home page in the 3 i’s section! Happy Birthday SCT! Thanks so much for a fun and inspiring week! My favorite section of the magazine is typically the essentials section. It’s always so fun to see the new items that are out. I loved the sweet doggie on page 68, the bright color wheel kept calling to me. I love this magazine, the blog, the classes. This is such a great place to visit on the internet. I don’t have anyone LIVE to scrap with so this is my scrap room friends. Happy 13 and many more. Also a big thank you to all the companies that offer such great prizes. 10 most wanted. I dream of the ways I can use new products. I get so much inspiration from the magazines. I only wish I could have thoughof some of the ideas on my own. Creative Cards was my favorite section as I quickly skimmed the magazine! I’m happy to know this site exists and hope to return often! The projects are beautiful. Always so much inspiration here!!! Happy Birthday SCT!! Talk about ending with a BANG!!!! That final prize is unbelievable. Love the entire magazine but I always go to the 10 Most Wanted first to see what’s up and whether I have any of it……yet!!!!!!! Thanks for a great week! I enjoy looking at all of the ideas and inspiration. I appreciate the ideas for the cards as I mainly create cards and often need inspiration. Happy Birthday and Thank You for the chance at winning! I like looking for different colour combinations as that is a challenge for me. Thank you and Happy Birthday! Awesome magazine love each issue happy birthday. Love the Product Play article as I am deeply in to organizing my craft space right now. Thanks for the giveaway! Happy 13th!! My favorite part of the magazine is the inspiration challenge. I love how many different ways one design can inspire another (colour, theme, layout, etc)! Here’s to another crafty fun-filled year! My favorite article is Creative Cards. I love seeing how different designers use their products for fun and beautiful card designs. What a great layout Paige! As always a beautiful layout ~! Thank you for the cut file! I do have to say the top 10 is usually ALWAYS my favorite part of the magazine but Love to always get new ideas from the inspiration pages ! Oh heck, who am I kidding, the whole darn magaizine is my favorite! HAHAHA! Happy Birthday SCT and Thank you for having me celebrate with you! I hope there is at LEAST 13 more ! Absolutely loved the creative cards. I love so much about SCT magazine it’s hard to pick a favorite. But for this particular issue I loved the tags made by Jen G to kick off the 10 most wanted. I circle and make notes and tab so many pages in every issue! This prize package is beyond amazing. We, your readers and crafting family, could not be more grateful to be able to hold this beautiful magazine in our hands and sight each and every issue. Your generosity in offering prizes is beyond compare. You are not just a magazine to me. You have brought people and experiences to me that I cherish and my life will forever be better as a result. Thank you. Paige…. wow!!! The time and patience her work takes just blows me away!!! I am so loving all the inspiration! What a wonderful giveaway American Crafts! Thank you so much! My favorite section is always the Creative Cards. I’m a stamper and a card maker and I love seeing these ideas and using things from my stash to replicate them! I’ve often loved something so much I’ve purchased the products! I also love all your free cut file. I have a silhouette that I use often in my card making and all these terrific free files add so much to my cards! Thank you! My favourite section in your magazine is Creative cards and pocket pages. I love the ideas and then make my own cards or pages from there. Happy 13th Birthday, SCT! This is my first issue, so it is very hard to pick a favourite when there are so many exciting and inspiring ideas and layouts. I especially liked the Designer Challenge. It is so much fun to see how the same items can be reimagined to create totally different layouts. It truly appeals to my sense of creativity! The items in the 10 Most Wanted article, plus all the gorgeous advertisements, are figuring prominently in my birthday “wish list”. Thanks for a great magazine that is definitely a “keeper”! Wow, gorgeous prize package. My favorite part about your spring issue is just all the beautiful photos and inspiration that I can take with me to crops to help with my crafting! What a wonderful Spring issue. It is packed with so many wonderful ideas, inspirations & product highlights. I really enjoyed the 10 Most Wanted section and looking for the Hidden Treats was fun too! 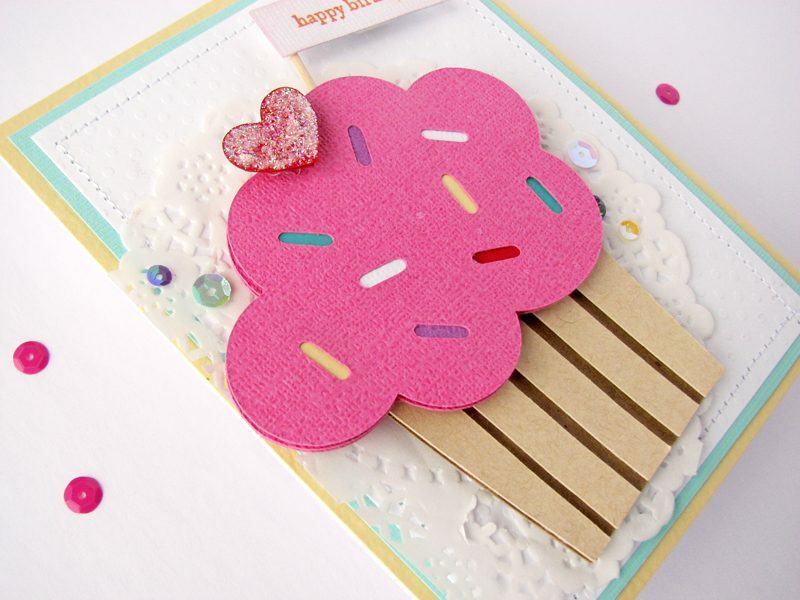 As a card maker, I always enjoy your features on cards but this month, I also love the 10 Most Wanted as that Picket Fence Studio blender brush looks especially interesting. I might try an embossing paste or dry emboss and ink blend card as they look quite interesting and lovely. I love the ten most wanted article!! I love learning about all the new products I need to buy! Ha! The spring issue is wonderful. I love the Page Maps sketches and projects using them. I had fun looking for the treats icons. Thanks for all the fun challenges and things to celebrate your birthday. Great spring issue! I always enjoy the 10 Most Wanted because there aren’t any LSS around me for miles. I can see what is new quickly with your article. Happy birthday SCT! Thanks for the chance to win fabulous birthday goodies! I have really enjoyed this birthday week. Kind of sad to see it end! So many beautiful projects and fabulous prizes. My favorite part of your magazine is pagemaps. I use it all the time for inspiration when I get in a creative rut. I am so happy you still publish a paper magazine! Thanks SCT and happy birthday! I have always liked the Takes 2 & 3 page – it is so fun to see several takes on the same theme with the same photo and just seeing the different approaches to them. My favourite part of the Spring Issues is all of it but if I have to choose one section it would be the article with all the new sketches!! Happy Birthday SCT!!!! I really enjoy the page maps sketches. Thank you for continuing to bring such great inspiration and happy birthday! Love the Top 10 so I can stay current. Happy birthday SCT! The Spring issue looks great. Hopefully I will great my hands on it from an order with Scrapbook.com. I love all the inspiration in the magazine & it’s even good to look back on different issues for ideas after a year or so. Top 10 section is my fav this month. Happy birthday! I haven’t cracked the spring issue yet. My family was away this past week for our spring break visiting the West Edmonton Mall for the first time. The kids had a blast! When we got home, the magazine was waiting for me but I’m waiting for the kids to go back to school for some quiet time with me, my tea & SCT…Happy birthday! What an amazing celebration!! Thanks to all the awesome sponsors and all the wonderful projects everyone has shared! I love the Designer Challenge in the Spring issue! I love seeing how different everyone creates with the same basic products! So inspiring! I adore all of it of course but I look for the designer challenge first. I love seeing completely different takes using the same products. This magazine has the best of everything. You give a nod to traditional scrapbookers who can use layout maps as a springboard. You reach out to digital scrapbookers, hybrid scrapbookers, and pocket scrapbookers. You offer ideas of all sorts of stories to tell, which is helpful for my friends who say, “My kids are grown, I have nothing to scrapbook.” You recognize that paper crafting includes cards (although I would like to see more with cards), and I love that you are offered in digital format. Thanks for this week of awesome, and Happy Birthday! Thanks for letting us celebrate your 13th birthday ! Hope you are around for another 13 . Love the page maps and the 10 most wanted this spring ! Makes me want to craft some more ! I haven’t received my hardcopy yet – so I did take a ‘peek’ online at the current issue. I would say one of my favorite sections is all of the new products that are pictured. I really do love this magazine….the pages are crisp and clean and I lovingly turn each page. The grand prize give away is absolutely amazing!!! Happy Birthday SCT! I always love seeing new products in the magazine but I also love the Tips Tricks & Techniques section. The whole magazine is a thorough treat, though! I really enjoy seeing new scrapbook design ideas and products. happy Birthday! Happy 13th Birthday! Love the pretty LO and thank you for the great cut file Paige! Love how you put all the pretty colours behind it and added all the flowers. What a beautiful birthday LO for this sweet little lady. Nicole, thank you for sharing the fun birthday card. Cupcakes on a paper doily and sprinkles on top. How much fun is that! I always look forward to and enjoy each issue of SCT. It is especially important to me now since there are no B&M stores any where close to me and the few chain stores that are located about an hours drive away have stopped bringing in all the new and exciting tools and products. Relying on ordering online means you can’t see or try a product before you buy but when you show it or demo it either in print or on your blog or FB it gives the consumers a chance to see what it can do and how it can be used. You have become the link between us and the manufacturer. A very important and helpful role. I enjoy the great articles with all the beautiful projects and how-tos and of course always looking for a great sketch for a card or LO. Yours are always so clear and professional. My favourite part of the Spring Issue is the PageMaps section. I get to create with these maps using the products that I purchase. It has been so much fun viewing your blog this week. I’m hooked!!! My favourite part of the Spring issue is the sketches and the fabulous inspirations from the sketches! There really isn’t one thing I can point out as my most favourite part of the Spring issue. The colours are fantastic, the ideas, even the advertisements. If forced,I’d say I most look forward to the “10 most wanted” section. I just love this issue but my favourite is product play. I adore organizing my supplies and this column always ramps up my interest. Gorgeous magazine! And today’s creations are stunning!!! The page maps section is my favorte! The 10 most wanted section is my favourite. I like everything about the magazine! Even the ads! I haven’t had a lot of time to look through it, but it did guide my card-making this weekend at Crop & Create Winnipeg!! Love the whole issue hard to pick just one! I think that it would be a breeze to find serious inspiration on every single page of this issue. Wow, it’s beautiful. My favorites were the designer challenge and the pagemaps… and WOW, that paper cut piece (hand-cut!!!!) in “With Love” was so amazing! I think that it would be a breeze to find serious inspiration on every single page of this issue (what a fun challenge that would be!). Wow, it’s beautiful. My favorites were the designer challenge and the pagemaps… and WOW, that paper cut piece in “With Love” was so amazing! My favorite? Gees everything. Really love all the how to’s, inspirations of course. Wow what a giveaway! My favorite part of the Spring Issue is the different takes on the cover photo layout! I love this most in every issue – it’s so amazing to see how different styles look! Love it! WOW what an amazing loot bag for a birthday party!!! 🎊🎁🎉. I have enjoyed browsing my moms copy of SCT and it is just packed full of so many ideas and inspiration, all of which I need!!! Looking forward to scrapbooking with my mom and carrying on a tradition that was started with her and my grandmother. I have many scrapbooks my grandmother created just for me and I wlll treasure them always!! This loot bag would certainly help us create many more amazing albums!!!! Thank you for a great week of celebrations and wishing you all the best for many more years of success!!!! I love SCT especially all the layouts. My favorite about the spring issue is all the scrappy inspiration! Love anything to do with pocket pages! Would love to take the class for pocket pages! Thanks for the giveaway! What an amazing celebration! I love the pocket play. I like the sections on Pocket Pages and Celebrating New Things- they have awesome ideas just like the rest of the magazine! Amazing, amazing and more amazing! Best birthday party ever! I can’t choose a favourite part of the spring issue – it’s all great! Though I’m finding myself focusing more and more pocket pages, so I enjoyed that! Honestly my favorite part is all the ads for new products. I love to see all the exciting new stuff out there. Woot, Woot! What a way to finish off your 13th Birthday Celebration with such an awesome grand prize! Thank You to Paige for the gorgeous layout inspiration and Nicole for the darling card inspiration today. In response to today’s question: I always LOVE everything about the SCT magazine and enjoy re-looking and reading the issues all the time. My favorite overall is being inspired by the layouts, sketches to create and the tips and techniques offered. HAPPY, HAPPY Birthday and Thank you SCT!! Inspiration section I always needs some !! love the pocket play section. I’m big into pocket scrapbooking. love the layout in this post. absolutely gorgeous. makes me want to do a 12×12 page again! The card section is my favorite-great inspiration. What an unbelievable giveaway! I love the new issue, it was my first time to order it in the mail. I’m so glad I did. It has given me so many good ideas for layouts! The sections on Pocket Pages and celebrating new things definitely caught my eye. Happy B-Day SCT! What an awesome prize package! I found the pocket page tips very helpful and inspiring! Happy 13th Birthday! I love all the layouts and great ideas that each issue has. Always inspiring and gets my creative juices flowing. Wow! Such an awesome way to end a wonderful celebration! My favorite part of the new spring issue is the 3Ts. ﻿I loved layout 3 and how to add more texture to the design and I think Jennifer Gallacher made a gorgeous layout. Thanks for the chance to win and again Happy birthday! All of it is my favourite! Happy 13th Birthday SCT and thank you for sharing your birthday celebration with all of us. I could never pick a favorite part of your wonderful magazine! It is always chucked full of inspiration!! What. Great pile of oot that any scrapbooker would cherish to win. Happy Birthday! For me the 10 most wanted essentials. Wow! Congratulations! I love the magazine and been getting it for a while, my favorite parts are the sketches and the cut files. Happy birthday. I love seeing how everyone else uses the pagemap sketches! HBD!! Lots of inspo in the issue, but nmy favorite pages are something II have struggled with ever since I started scrapbooking… FLOWERS!! thanks for making me seem them in an updated way! My favorite parts are the top 10 must-haves…nice to see what’s new…and the Pagemaps! LOVE that! Happy #13!! LOVE all the sponsors that help you celebrate! My favorite part are Pages 59-60 Design Your Story by Cathy Zielske article. She’s a fave and I love her design work and storytelling! My favorite…..I like it all! I love it all but Nicole Nowosad’s felt flower layout is really cool! Love the Pocket Play and 10 Most Wanted sections in the SCT Magazine. Happy Birthday SCT, your beautiful layouts, cards and designs give me such wonderful inspiration everyday. Thanks for the chance to win this awesome prize too. Happy Birthday SCT!!! I love your magazine and my favorite section is the “10 most wanted” we always need to know the latest and greatest tools to use when we scrapbook. The rest of the pages are great also! I always learn something new! How do you pick a favourite when you love everything? Love the 10 most wanted list. It’s a cool way to discover new products. Great job SCT! Happy Birthday SCT! I love your creative layouts with step-by-step instructions! Happy lucky 13th! My favourite is the creative cards and also the sketches! I love the Inspiration Gallery. I am new to scrapbooking and cool layout ideas don’t come easily. Thanks for the ideas! I always gravitate to Page Maps, the “10 most wanted” and Cathy Zielske’s article! But just staring at all the eye candy is truly my favourite part of the experience. Happy Birthday SCT! You always have such amazing inspirations! It’s hard to narrow it down. All the best and thank you for this wonderful opportunity! So many inspiring projects and great prizes. I enjoy all the cards displayed since I get inspiration from them. Wow what an amazing give away!! Again, thank you to all the sponsors and to SCT!! I just love the whole magazine. The inspiration is amazing. Thank you for all the chances to win and good luck everyone! I am a huge fan of Page Maps. But your entire magazine is a feast for the eyes and inspires my creativity. The prize is amazing! I haven’t gotten too far into the new magazine yet, but I am loving the two page layouts I’ve seen so far! I love the part where it talks about storing your embellishments! I always struggle with that and where to find everything! Thanks SCT! Lovin’ the banner layout … just downloaded it – Thanks !!! Happy 13th birthday! Love, love, love SCT. I love the events, I love the magazine and am thankful to Catherine and the whole SCT team for everything you do. I can’t pick a favourite but I will say that the pagemaps keep me productive on a monthly basis! My favorite is usually the different cover page layouts but the hide and seek contest was pretty fun! I love the top 10 most wanted section. I always want to know the latest and greatest toys! Happy 13th Birthday, I love the magazine and all the techniques, I am going to try the pocket cards into my scrapbook pages. Thank you for the chance to win. Your magazine is the most creative,inspiring and beautiful!I wish the following birthday note with the same scope!!!! What great projects! I love Paige’s banner page. Can’t wait to try it. I got my magazine today and haven’t been able to put it down! I love the Designer Challenge – it’s hard to believe they use the same products. I also got a kick out of Susan’s memories of turning 13. Happy Birthday SCT. Great inspiration as always! Happy Birthday and many more! I love Sketches — I’ve kinda got a problem. I’m a sketch junkie! Paige love that layout! Now i gotta figure out cut files! 10 most wanted i would say is my fav in ghis issues! 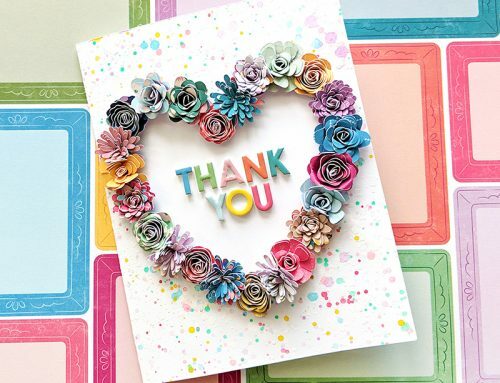 Thanks for all you do to support scrapbooking and card making! Awesome week! Thanks for all the inspiration. Loved the 10 Most Wanted article. While I like everything, if I had to pick just one, I would say the top 10.Alwlays like to see what’s new out there. Love all those flowers on the 3T layouts!!! Happy 13th SCT!!! To 13 more! I love the pocket play section. I adore this issue’s cover. I also always enjoy the top 10 list and Cathy Zielske’s column. Oh and the page maps as well. Your magazine is always fab, but these days I am enjoying the pocket page stuff, including the 365 pocket class. Thanks for including us in your birthday celebration. These projects are so very incredible! Happy Birthday! My fav is the 3is…ideas, insights & inspiration. 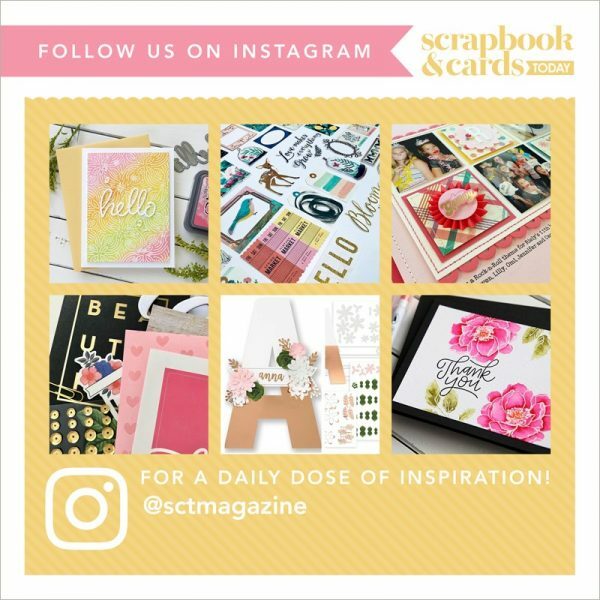 Love Scrapbook & Cards magazine! WoW, already 13 years! I love your magazine. In the last issue, my favorite article was the 3 T’s – Tips, tricks and techniques. Thank you for the lovely contest. The Ten Most Wanted article was interesting, to see items many crafters use , that I don’t have yet. I’m a big fan of “10 most wanted”. Love seeing the new products. Happy 13th.Many more. Such a fun celebration SCT! Thank you for the inspiration too. Paige’s page was gorgeous!! My favourite part of the spring issue is seeing all the beautiful projects submitted by readers. I always get inspired to try something new! The mini albums!! Happy Birthday again and thank you to all the wonderful sponsors and for the chance to win some amazing prizes!! I like the make it mini article in the magazine. Happy birthday!! Love the layout maps and that mini album!!! The essentials were my favorite. Great ideas and inspiration! Happy birthday! My favorite part of the Sping Issue is all the layouts, card ideas from your readers. I love seeing all the ideas, and yes stealing quite a few. But I LOVE seeing where they are from. Makes me proud when I see some from my province! Great birthday celebration! Thank you and the sponsors for all of the great prizes! Favorite part of the Spring issue? I always like to 10 most wanted…..checking out what is new. However, I have to say I do like the entire magazine. Thank you SCT for such a beautiful magazine! Love the magazine! The Ten most wanted and sketches are great. Wow, what a prize! I adore the cut file, and what a gorgeous page from Paige. This issue I’m loving the pocket play article in the magazine. I think Meghann Andrew is so talented and inspirational. Thanks again for being the best magazine there is. Happy birthday SCT! I love the Creative Cards section of the Spring magazine. It’s been a great week SCT! Happy Birthday!! Happy 13th Birthday! Thanks for all the great giveaways! One of the things I love most is the free cutting files. They are great! They cut perfectly! Such an amazing giveaway! I love the “she loves to read” layout and the idea to document a bookcase … perfect for documenting the other hobby and decorating style at the time! The layout is super cool, I can’t wait to try it out myself! I think I’ll use a photo of my granddaughter and her first birthday cake! My favorite part of the magazine is PageMaps, I’m a sucker for sketches! Happy Birthday! My favorite was seeing all the pretty colorful scrapbook pages. WOW!! 1st off Paige is amazing!! She’s so talented and so is everyone that shared their projects!! And so inspiring!! Thank you!! 2nd that’s an amazing giveaway AC!! I just love all your products!! Holy smoke!! 3rd I have always love the 3T’s sections!! But I also love the sketches and all the new products coming up!! I didn’t know Michaels had a tumbler spinner!!??!! Thank you so much!! And Happy Happy Birthday SCT!!! I love the pocket play section and the “10 most wanted”. Thanks for the chance to win and again Happy birthday! One last HIP HIP HOORAY for you guys as you celebrate 13 years… wow… how fast time flies… Well just wanting to let you know that my favourite part of the Spring Magazine is the Inspirations Gallery.. (the whole magazine is inspirational by the way) but being a New Nanny to 3 gorgeous little baby boys… I am needing all the inspiration I can get to start on the albums for the three baby boys… already have lots of photos and your magazine certainly inspires me.. so thankyou…. I always enjoy the Project Play. All of the projects are are so inspiring. Happy Nirthday! My favorite part of the Spring issue is the Fabulous Flowers! That’s a toughy! I loved the Essentials and the Designer Challenge the best! Always wanting the newest products, reviews and fun stuff and how your clever and talented designers make those fabulous projects!! Love your wonderful magazine and am your biggest fan! I always love your magazine. I really appreciated the pocket page. I am doing more of those myself. Love the 3T’s – Tips, Tricks and Techniques. Amazing inspiration! Happy Birthday to a splendid, creative magazine. Always look forward to every issue. Loved so many of the articles and features in this publication; but especially Design 101 – basic design elements stand the test of time and are always inspirational! Thx! I always love being inspired by the layouts that are included. I love the Top 10 Section and the layout 3 ways so inspiring. I love the cover page and the other two projects using the same photo. So fun to see different ideas. Can’t tell you my favorite because I am still looking! I eagerly await each issue! Thanks so much for the wonderful giveaways! I always enjoy the card making section for new ideas. I also like the advertisement pages that show me new products and ideas. AMAZING! The giveaways and inspiration is wonderful ! I have been reading your magazine for 13 years and I still love it and I love all sections! Can’t choose just one! I do really enjoy the “3T’s” section. Always fun to see different techniques and get ideas, tips and tricks!!!! Truthfully though, I love your whole magazine and always look forward to going through it from cover to cover, over and over again!!! Thanks for such an awesome magazine!!! Sad to see the end of your celebration for this year!!! Look forward to another though, and many more after that!!! The birthday layout is so cute and the give away is spectacular! I’m keeping my fingers crossed. I love your entire magazine so it’s hard to say. But if I have to chose…I’d say the pocket play. Love the ideas. I’m just loving Paige Evans! Her layouts are so pretty and colorful. Happy birthday! As usual, I loved Cathy Z’s article. Being I have been documenting my family the past 10 years I love the inspiration and tips with the pocket play! Happy Birthday & Here is to another awesome year of inspiring & making us excited to create & capture the little moments because that’s what makes scrapbooking that much more fun! The mini albums were my favorite from the latest magazine issue. It’s sad to see the celebration end, but how exciting to see who the winners are of all the fantastic gifts. I loved the spring issue and am always so inspired, but my favorite is the pagemaps. The Top 10 section is my favorite, I love new ideas! So sad to see the Birthday Celebration ending! What a wonderful 5 days! Thanks so much for all the inspiration and the amazing a generous prize packages available to win! Its hard to pick a favorite in the new edition! I think it would be the pocket pages! Followed closely by everything else lol!! Hard to decide what my favorite is…I love all of it….thanks for celebrating your birthday with us! I love the entire magazine, but my favorite is the 10 Most Wanted followed closely by the Page Maps. The Grand Prize is absolutely amazing!! We very favorite is PageMaps!!! I look there first! My very favourite part are the free downloads – the cut files to match the layouts used!!! Love recreating the pages in the magazine with the help of these files! Happy Birthday! I loved the Pocket Play section! Thanks for a great giveaway. Happy Birthday! Congratulations!! I LOVE card sketches!!! Loved the article on Creative Cards. And this probably sounds crazy, but I really love looking at all the ads, lot’s of inspiration there! Wow! Look at all those gadgets! I love gadgets in my kitchen and my craft room. They make life so much easier. I love papers, so I’m always drawn to them whether they are used in a project or in an ad. Apart from the beautiful inspiration I always love the 10 Most Wanted…..it’s good to see what I’m going to be spending my cash on next! Congrats SCT. I love everything in the magazine, but 10 most wanted and page maps are among my faves. I love the free cut files you offer as well. Happy 13th, here’s to many more! Congratulations on your 13th birthday! Paige Evans’ layout is a dream, love every detail of it! The birthday card is very cute too! I don’t know which is my favorite part of the magazine, I recently subscribe to the printed version and I’m in love, it makes me happy. It’s been years since I don’t have a scrapbook magazine in my hands to enjoy and feel, love everything of it, from the quality, size, ideas, details, sections, you name it! To choose a section I like more, I can say the Ideas, insights and inspiration because there are a variety of beautiful and inspiring projects. Thanks for this incredible magazine! Hard to pick just one,but the really liked the 3I’s…lots of great ideas in the whole issue though. Happy 13th and here’s to many more years. My favourite part of the magazine is that you’re still publishing it! Truly. I have always been a magazine hoarder and I love that’s I still have SCT to read in the bath; on the train, in bed at night! Thanks!!! I love this layout, and wish I had an electronic machine to cute this download – it is wonderful. over the picture – it is so special. Thank you AC for giving such a great prize to SCT for give-a-way, the sponsors for their birthday have been very generous. Happy 13th SCT – I can’t wait to see what this next year brings. I absolutely love your Tips, Tricks and Techniques. In particular, this month I loved the crepe paper flowers that Jen Gallagher had on her shared layout. LOVE LOVE LOVE! Happy Birthday, SCT! Awesome prize. My favourite section in the new edition is “Creative Cards”. I’ve been wanting to try stencilling and marking so the article gives me lots of inspiration. Besides the ad for the new Echo Park Lost in Neverland? Hahah. Page maps is my favourite part. Whenever I am stuck I love to have a “blueprint”. I love the top 10. Actually I love the whole magazine. What an awesome grand prize giveaway. You always amaze me. Thanks for a chance to win it. American Crafts generosity is always outstanding. .. a great giveaway package.. enough to share with my friends. Catherine, family and friends you have a great magazine and we love the events. Keep up the great work. Eventually I will run out of room to store every issue of your magazine. This would be super amazing to win! Thank you for the opportunity!! I love the entire magazine but my favourite is definitely the 10 most wanted!!! Thank you and Happy Birthday SCT!! Happy Birthday!! Thanks for all the awesome prizes and inspiration. I like the pocket play – I am learning lots with the online course. I love the creative card section! Scrapbook and Cards Today magazine is the best magazine ever. It is full of inspirational ideas from sketches, new products, and colorful designs to keep us crafters going. American Crafts and all you other companies out there are fabulous for supporting Scrapbook and Cards Today in putting out their magazine and giving us the opportunity to attend their Crop & Create events. Without your support it may not be possible. Thanks for the opportunity to win this great giveaway. Happy birthday once again SCT. Love you ladies (and Jack), your mag and your company!!! You are a huge part of my life!!!! I love the ads for all the products! This month I think the inspiration challenge and the mom card by Latisha Yoast is especially pretty. Gorgeous layout!! And amazing prizes. Happy Birthday SCT! Thank you for all the inspiration. Wow, this is so generous. I love your magazine! I love that I can get it free online. I love the Top 10 new product section — to see if I’ve missed anything that’s available. I love the ads too, because they tell me about new products too. The page maps are super helpful, and I think the entire magazine really is great. Wow! It’s over already? My favorite part of your latest issue as always is the top10. I’m a gadget girl so I love to see what I might need to keep my eyes open for. But what I really enjoy is simply having a magazine in my hands, to page through when I’m not on media. And a magazine that’s not just full of pictures of other people’s work. Page maps and articles are always fun even if it’s just a reminder of a technique I already know but with current product’s. I love every inch of your magazine. I always drool over the 10 Most Wanted section. I love to see what is new and hot off the press. Happy Birthday SCT, thank you for all that you do for us. Page Maps for the layout inspiration and Product Play (I think that’s what it’s called) for new ideas for organizing my room. That is an amazing giveaway!!! Fingers and toes crossed! The magazine is pure joy from beginning to end (even all the beautiful ads are fun to look at…but if I had to pick – the pocket page article this issue was my favorite because I am trying to use this style more for more story telling. Happy Birthday SCT from the bottom of my heart Thank you for continuing to inspire us all! Thank you to the amazing sponsors and companies! Wow! What a great week of inspiration. Happy Birthday SCT! Thanks. Happy birthday! I enjoyed the design maps article. I’m more of a scrapbooker, so I always enjoy the layout inspiration. I enjoy the Designer Challenge and this one was awesome! I was amazed at the diversity among the same products!!! My top pick here (although I thought all three were stunning!) was Jana’s, because I love to fussycut as well (so therapeutic). I always appreciate the free cut files, too. Thanks for a beautiful, trending publication that has more inspiration than adds!!! Keep up the good work! And, again… Happy Birthday!!!! Pocket Play is always my favorite! I do love the advertising to see the new products available! I too love your magazine and today’s inspiration is fabulous. Thank you! Happy Happy Birthday my dearest friend!! I really enjoy reading the 3T’s section. In the 2019 Spring issue, on page 37, Design 101: why it works is my favourite. It helps me plan my layouts and what would work best. In an age where actual magazines are a dying item I am grateful you are weathering the ever changing world and wish you much success! Thank you for 13 years of inspiration and wishing you many mor years to come! I love the helps, tips and instructions! I really like the Sweet and New circular puppy page. Really different and great colours accent the black puppy. I love the page maps for inspiration and also the top 10 list. It’s always nice to see what’s popular in the crafty world. Love it all! All the great ideas to scraplift! Super Amazing. This last day prize package is so inspiring. Happy Birthday Celebration to SCT. I loved creative cards. This has been a wonderful way to have your readers be a part of your 13th birthday celebration SCT! Again congrats from the USA! What a gorgeous layout! I love all the inspiration but this month I especially like Design 101! Keep up the great work! loved the 10 most wnted things articule. Wow what a beauty. Would love to win! I always love looking through The Essentials. Love the new & different & colorful products. I absolutely LOVE the pie chart layout with the puppy on pg. 68 and will definitely be scrap-lifting the pattern. Thank you for always inspiring me to step up my art! Love all tbe bright & beautiful flowers in all the layouts. What a great prize, thanks for the opportunity to win!!! I enjoy seeing all of the layouts for inspiration. Thank you for the chance to win a great prize. I especially like the ideas for cards – I make cards for a children’s charity. Thanks for the great give away! Those tags on page 11. Although I do love me a good layout. I love everything about the magazine, but the top ten is my favorite. My favorite part of the magazine was the 3ts section with all the gorgeous layouts and sketches! Thanks for the wonderful week of birthday specials! I liked the section about finding inspiration in and scrapbooking about new and different things. Like new clothes and favorite books. I always enjoy the layouts and endless inspiration!! My favorite part of this magazine is the essentials, I love seeing whats new or whats in. I do love your whole magazine I am always inspired by it, I often go back to previous issues to get inspiration. Often this magazine is my starting point for a scrap page or card. Love all you do. Thank you for another great year. I enjoyed the Designer’s Challenge. It’s amazing how different people can take the same things and come up with something so different. Happy Birthday SCT! Lots of inspiration here! I really loved th newe Design 101 column, and the piece on mini albums! Love to have layout ideas, always useful! Thanks for organizing the contest! My favourite part of your spring issue is all of the amazing work being shown off! I’m totally inspired! Thanks again for such amazing prizes!! Wonderful layouts in the spring edition. I especially liked the double page spreads and the 3is. I always enjoy the Pocket Play section. I liked the Design 101 in this issue. I love that your magazine offers so many tips and tricks and features a wide variety of products. Happy 13th Birthday, looking forward to seeing everyone at Crop & Create Calgary! Happy 13th Birthday! My favorite section of the spring issue is Tips, Tricks & Techniques. Thanks so much for the inspiration! My favorite part was the page maps followed closely by trips, tricks, and techniques. This has been a wonderful celebration that is full of inspiration. Thank you so much for sharing with us! My favourite part of the issue is the 3is. I really liked all of the inspiration in those pages. Happy Birthday and thanks for the opportunity to win such amazing prizes!!! Thank you for an exciting birthday week full of amazing inspiration and generous giveaways. It is not possible to pick a favourite in the magazine….I even love the pages filled with adverts. Happy Birthday! Happy 13th Birthday, and what a wonderful prize pack by some amazing sponsors! Happy 13th Birthday 🎂 and many more to come! I like beautiful spring layout designs, Paige’s layout and cut file, new inspiration and news in the industry. I love the 10 most wanted feature. It’s always exciting to see exciting new products. Happy Birthday SCT! Thanks for the chance to win these exciting prizes! I always love SCT from cover to cover so I’ll start at the beginning…one of my faves is always the inspiration in seeing three different magazine covers. I went through it several times and couldn’t find a page I didn’t like. Even the ads, as they are so relevant. I got so much inspiration from the whole magazine. Thank a bunch! What a great way to celebrate a birthday. I didn’t even know this magazine existed until today when a post showed up on my newsfeed. I love the product ads/demonstrations and all of the inspiration from cards to scrapbook layouts and beyond! Love the spring colors of this issue…hard to pick a favorite but…I do love reading tips and inspiration from different people. The new products are always a favorite too! I like to see scrapbook pages, so Design 101 was of most interest to me. I like to be inspired, but I also like information about why a design works. I love all things about the offerings within each and every issue. The awesome postings within this celebration are outstanding. I really enjoy the Designer Challenge component of the magazine. I often find myself seeing product from one view only, but I find the Designer Challenge refreshing. I like seeing how multiple people use the same products to get entirely different moods and feels while also getting ideas on ways to use a product in a way I never thought of. Loved the Inspiration Gallery (the most, I think, it is hard to pick), Designer Challenge and Creative Cards. My favorite part of the magazine is the inspiration I get from so many talented individuals. I find when I am scrapbooking, I tend to stick with the same structure over and over again. Once I start doing that, I know it is time to break out the magazine and get some great ideas that get me out of comfort zone, and I love it! Happy Birthday !!! Thank you for all your great work !! I’m always inspired with your page layouts, colours ans page map. love it. It help me a lot. Thank you for this great context. I love the 3Ts about florals. So inspiring. I have to say that I love a LOT about every issue but I always look at the PageMaps section because I almost always see a new way of doing a layout that I hadn’t thought of! I also enjoy the Tips and Tricks and the designer challenge. Great inspiration for me! Happy Birthday SCT and thank you and all your partners for helping to keep a craft I care deeply about fresh and new and fun! I love the pocket play part! Love the sketches – always! I love the section on new products. Wonderful magazine to read too. Thanks for awesome prizes and the chance to win. I almost fell out of my chair on this giveaway. Wow, just amazing products. Happy birthday to us all!!! SCT and all the sponsors rock!!! Happy birthday SCT! I haven’t had a chance (yet) to look at the magazine’s spring copy. BUT usually my favourite is reading all the little comments made by each page/card. That’s where my creative juices flow when I see new ideas. I always enjoy the 10 Must Haves. Happy Birthday and thanks for a great celebration! New products always spark my interest, but the sketches are the best!!! Love that layout and it’s a great issue too! My favorite section is Creative Cards! I love the tip and techniques section. I learn so much from it. I also love all of the inspiration from everyone. So many great layout ideas in this issue. My favorite part is always the page maps. I love to collect and print them so that I can easily refer to them while I craft. I really loved all the color in here as well. So inspiring! OMG wow, what an amazing grand prize!!! It’s an amazing magazine, but I like the 10 most wanted section.